The Electrical Engineering Department at Colorado School of Mines had two award winners at the 2018 Institute of Electrical and Electronics Engineers (IEEE) Region 5 Annual Conference. 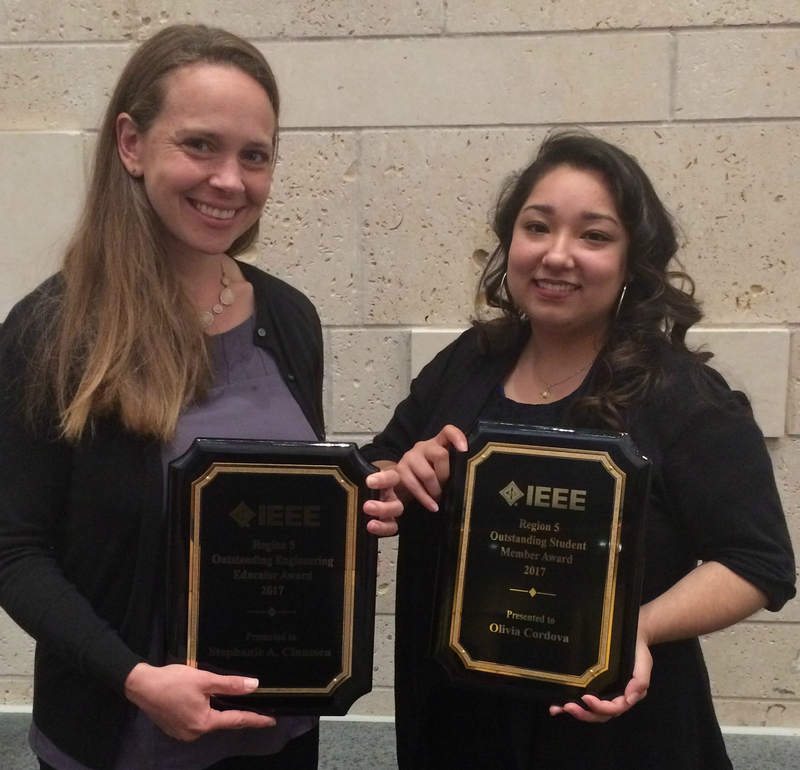 Stephanie Claussen, teaching associate professor of electrical engineering, and electrical engineering student Olivia Cordova were both honored at the conference, held April 6-8 in Austin, Texas. Claussen, who joined Mines in 2013, was named Outstanding Engineering Educator, an honor given to an IEEE member who has performed in an outstanding manner in the field of engineering education. At Mines, Claussen teaches Fundamentals of Engineering Electromagnetics (EENG 386), Semiconductor Device Physics and Design (EENG 421) and Introduction to Electrical Circuits, Electronics and Power (EENG 281). She holds a PhD in electrical engineering from Stanford University. Cordova, a senior majoring in electrical engineering, received the Outstanding Student Member award, which recognizes outstanding contributions of time and effort to the student branch, section, region or national IEEE to advance the principles of IEEE. In addition to IEEE, Cordova is active in the Society of Women Engineers and won a Martin Luther King Jr. Recognition Award earlier this semester for her work to educate the Mines community on the benefits of diversifying campus and reaching out to her fellow first-generation college students. At the conference, Mines President Emeritus Theodore Bickart was also honored with a Lifetime Achievement Award.